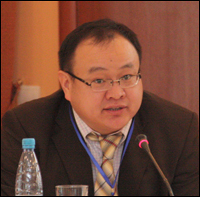 Prior to joining NRGI, Dorjdari worked for 11 years at Open Society Forum Mongolia. There, he led campaigns for improved extractives governance including EITI, transparency of government budgets and accountability of the government. He has been a member of the EITI board and the EITI Multi-stakeholder National Council. Dorjdari advised the government of Mongolia on mining contracts transparency, analysis and negotiation. Prior to working at Open Society Forum, he worked for rural development initiative in the Gobi region of Mongolia. At NRGI, his focus is on building capacity of parliamentarians, government institutions and civil society in Mongolia with regard to the more effective management of the extractives. He holds a M.S. in economics from Central European University and an undergraduate degree in financial management from Mongolian Science and Technology University. 59 min 3 sec ago.